This article gives you full details about Ronjan Sodhi who is the current No 1 rank holder in International Shooting Sport Federation (ISSF) world rankings. This article gives you details about Profile and Biography of Ronjan Sodhi. Career records and Medals won by Sodhi is also quoted in this article. Rojan Sodhi from India is one of the best trap Shooter in the world. Currently he is ranked 1 in International Shooting Sport Federation (ISSF) world rankings. Rojan Sodhi was born in Punjab, India in the year 1979 23rd October. Ronjan Sodhi is a Arjuna Award winner. His success career began in the year 2010. 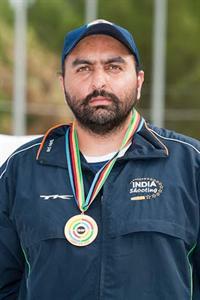 In 2010 Sodhi got a Gold medal in ISSF World cup held in Lonato Italy. In the same year Sodhi again got a Gold medal in World cup held in Turkey. He attains Two silver medals in 2010 Commonwealth Games in Singles and Doubles trap category. He won a Gold Medal in 2010 Asian games in Double trap event. Sodhi again showed some good performance in the year 2011. He got a Silver medal in ISSF world cup held in China and a Bronze medal in Maribor ISSF world cup. With these consistent performances Sodhi reached No 1 position in ISSF World Rankings. As a honor Punjab Government appointed him as Deputy Superintendent of Police (DSP) in the Punjab Police. Ronjan Sodhi is the first and only shooter from India to attain No 1 position in International Shooting Sport Federation (ISSF) world rankings. His dedication and consistent performance in last year made him in top position in ISSF world rankings. Before Ronjan Sodhi, it was America's Joshua Richmond in first position. Ronjan is now focusing to win a gold medal in 2012 Olympic games. At the present Ronjan Sodhi is training in Italy for his next shotgun World Championships Held in September at Belgrade. "It's a great feeling to be ranked world No 1. It was one of my dreams to be at the top of the ISSF rankings and now that I have reached here I plan to look forward towards my other goals and ambitions. The journey hasn't been easy but my determination was what kept me going and the last three years have given me a lot to smile"
"I now want to concentrate on my game for the 2012 Olympics as a medal in the Olympics is the greatest achievement for any sportsman,"
1)2010 ISSF World cup in Men's Double trap held at Lonato, Italy. 2)2010 Asian Games in Men's Double trap held at Guangzhou, China. 1)2010 Commonwealth Games in Men's Double trap singles held at Delhi, India. 2)2010 Commonwealth Games in Men's Double trap Pairs held at Delhi, India. 3)2011 ISSF World Cup in Men's Double trap held at Beijing, China. 1)2010 Asian Games in Men's Double trap team held at Guangzhou, China. 2)2011 ISSF World Cup in Men's Double trap held at Maribor, Slovenia. This article gives you complete details about Abhinav Bindra who is the first person for India to win a Individual gold medal in Olympic games. This article gives you Profile and biography of Abhinav Bindra. Awards and achievements are also quoted in this article. Career records of Bindra are also included in this article.